Wiley Marshall Parish was born on March 18, 1848 in Gadsden County, Florida and died on an unknown day in August 1920 in Blountstown, Calhoun County, Florida. He lived to be 72 years old. After the death of Georginna, Wiley married Rachael Spears (2/1853) on Nov. 1, 1883 in Calhoun Co. FL. Wiley PARRISH - enlisted May 10, 1862, and surrendered at Greensboro, North Carolina, on April 26, 1865. COMPANY NICKNAME: "ALEXANDER GRAYS" PRIOR SERVICE: Some members of this company were originally in Company B, 5th Regiment Georgia State Troops or Company E, 2d Regiment, 1st Brigade, Georgia State Troops. 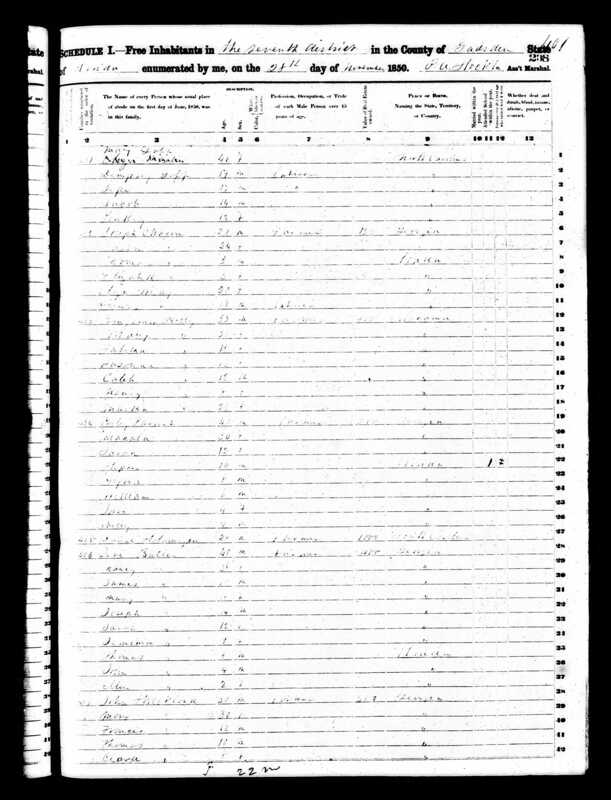 #266 - Wiley M. Parish	(age 54 March 1846), Rachel Parish	(47, Feb. 1853), Charles Parish	(19, Aug. 1880), Andrew Parish	(18, Nov. 1881), Della Parish	(15, May 1885), Jesse Parish	(12, June 1888), Ruben Parish	(9, Dec. 1890), Silas Parish	(7, March 1893), Daniel Parish	(3, May 1897). All were born in FL. Wiley and Rachel have been married 30 years. Click on any of the News, Events, or Discoveries buttons above to see historical things that happened during Wiley Parish's life. These are only some of the major events that affected the life and times of Wiley, his family, and friends. For example, Wiley is 7 years old when Third Seminole Indian War begins. It ends three years later when Chief Billy Bowlegs and his band are forced to move from Florida. Born somewhere in Florida on an unknown day in August 1875 and died in Blountstown, Calhoun County, Florida about 1906. She was about 30 years old.